We are an eminent entity engaged in offering an extensive range of quality assured Orthopedic Implants Self Tapping Cortex Screw. 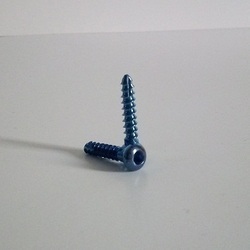 Offered cortex screw is usually blunt ended and to minimize damage to the soft tissue, this end should extend only a few millimeters into the soft tissues beyond the far cortex. 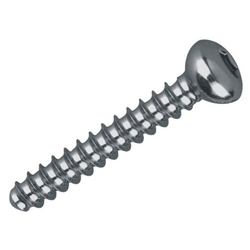 This cortex screw is examined on different parameters in order to provide a defect free range. 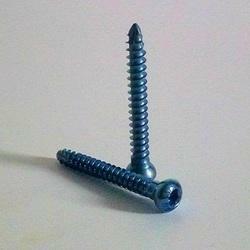 As well, patrons can avail this cortex screw from us in numerous specifications at reasonable rate. Delivery Time: Minimum in Shippig Time. With highly driven technical excellence, we have been able to offer our clients with quality tested Orthopedic Implants. These orthopedic eco cages are designed with the help of quality tested material & modern techniques in accordance with set standard. Our offered orthopedic eco cages are available in different dimensions, holes and sizes and are durable, high in performance and have high tensile strength. We offer these orthopedic eco cages to our clients in bulk quantity at competitive rates. We Bond Well Ortho Products are India's reputed manufacturer, exporter and supplier of orthopedic implants and instruments. We are manufacturing Best Quality Orthopedic Implants and Orthopedic Instruments as per ISO 13485:2003 Quality Management System and we have CE and FDA certification for our products which gives you assurance of best quality satisfaction.